De 2 a 2,5 horas de crucero por el atardecer en Oahu en un barco nuevo. En este Oahu Sunset Cruise, podrá disfrutar de un suntuoso bufet con una variedad de platos tropicales, que termina con té y café gratuitos. Para aquellos que prefieren una comida ligera, seleccione la opción de menú de aperitivo. Vea a continuación un ejemplo de menú. Cada mesa tiene 6-8 asientos para compartir con otros huéspedes, mientras que el comedor y el salón contemporáneo ofrecen vistas de 360 grados. Mientras te abrazas a la costa sur de la isla, recorre Diamond Head y el horizonte iluminado de Waikiki. Luego, con las estrellas que aparecen en lo alto, disfrute del entretenimiento en vivo a bordo. Antes de su llegada al puerto, tome su cita, familia o amigos y gire en la pista de baile, llevando este informal bufé Oahu a un cierre memorable. ¡AHORA PRESENTAMOS UN PAQUETE DE BEBIDAS HOSTED! Las bebidas incluyen: vino de la casa, cerveza y champaña junto con refrescos, café, té y jugo! Crew was nice. Food was below average. Didn't get out of the harbor in time to see sunset because of commercial traffic. Cruise did not go very far. Look at other options for the price. Would not recommend this outing. This was a very relaxing evening, I would redo this cruise. The family enjoyed the evening and the food. Views of Waikiki skyline and Diamond Head were wonderful. The only frustration was the arranged bus ride to the boat as they had to wait on at least two couples who did not understand they needed to meet at a pre-arranged location and we had to wait as they phoned them . We must have been the last bus load as everyone was already eating when we got on the boat. Since we booked this a while ago, I don't remember all the options, but we did see many people also got a lobster served on the side once they sat down to eat. Entertainment was a guy playing guitar, a woman singing and a single hula dancer. They were entertaining. The views were spectacular but the food was just so so. A bit of a disappointment for us. Great trip with the Majesty. 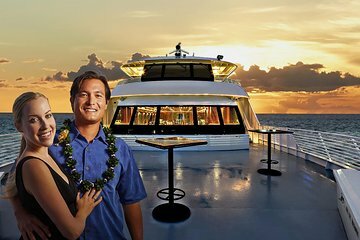 Our group of 14 had a lovely experience, Plenty of food and drinks, such a relaxing cruise, beautiful views of Waikiki at night, We captured awesome sunset photos and the entertainment was delightful. Really enjoyed the opportunity to be on the ocean. Very Nice!